This time of the year is a colourful and vibrant time for flowers, berries and foliage with lots of choice for brides planning an autumn wedding. It’s also a time when you can bring the harvest theme into your floral arrangements using vegetables like ornamental squashes as well as autumn fruits. their beauty every year, they look so delicate. Usually they come in shades of pink but there is a rarer red one which goes beautifully with the autumn colours. This autumn bouquet has berries and autumn foliage with roses and hydrangeas in faded soft colours showing its possible to have a country look at any time of year. dahlias for fun flamboyant buttonholes. 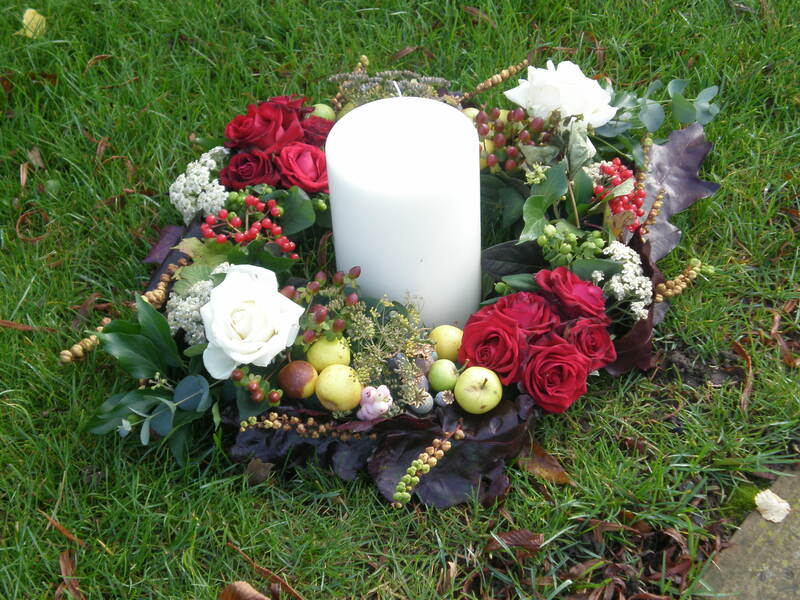 Right on trend at the moment are floral wreaths…a wreath is not just for Christmas! And they really lend themselves to weddings at this time of year. These beautiful circles of flowers and foliage, much of which was gathered from the gardens and hedgerows close to the venue for the reception, were used on all the tables and when the candles were lit the tables looked beautiful. The venue itself was a tipi, warmed up for the chilly evening with a fire pit. Inside the wooden framework offered the perfect framework for swags which were hung on the main horizontal support, and more flowers and ivy trails came down from the roof. 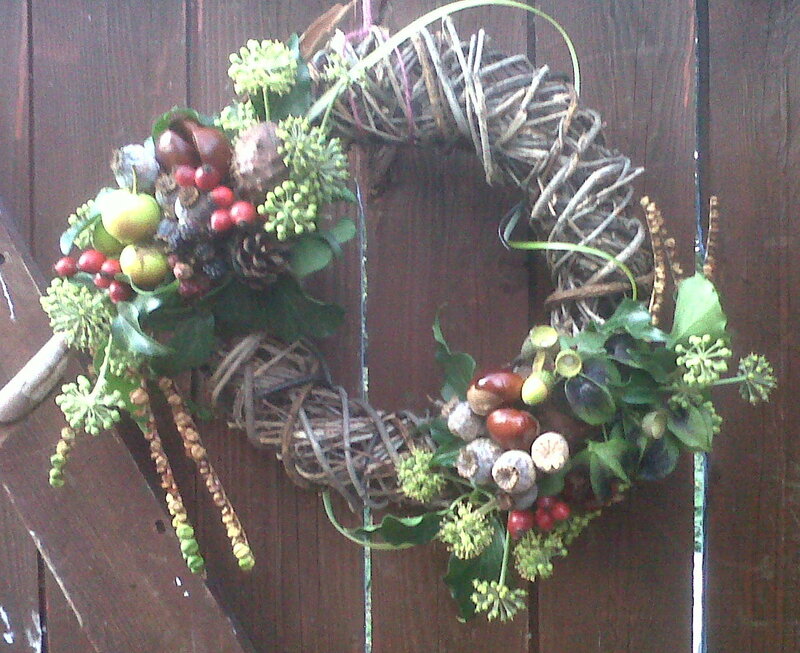 And for the door of your venue….or anywhere else for that matter, a favourite decoration with me, a simple twig wreath decorated with seasonal bits and pieces….everything from horse chestnuts to seed heads. I’m always happy to talk weddings with brides to be and their families and I make no charge for your consultation when we can talk though your ideas.